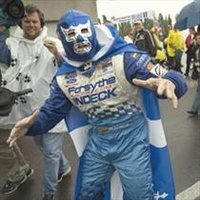 FoxSports says Tracy (who's stature in open-wheel racing has yielded a plethora of nicknames, from "Captain Crunch" to "PT Barnum" to "The Chrome Horn") is in Las Vegas to chat up Big Chip, who's in town for the N-Word event. Can't blame a guy for trying. I'm not exactly a huge fan of Tracy's, but the series would suffer to lose his antics in this pivotal season. Oh, that Gene Simmons ever had the, umm, initiative to put his money where The Tongue is and fund a team of Tracy and PJ Chesson. The profits from merchandise sales of such a dynamic racing team would just about cover the cost of the nearly-certain chassis damages. IF I were in Vegas I'd bet the ranch on Paul NOT driving for Roger Penske again. The thing I'd like to find out, will Bobby "the Rug Merchant" Rahal be instructing his driver to pull over if Graham is about to pass? A KISS sponsored car with PT and PJ would be super sweet! Excellent idea! However, sliding into a 3rd Vision car is more likely. Vision gave up all their spare cars to teams moving over, and I think TG soured on paying drivers over a million spacebucks a year after two years with Tomas. My bet is that it's going to be some sort of complicated deal with Ganassi and either Vision or Walker, to placate him along with getting him on a team more in line with where he's at in his career. #1) Yes Michael, you wouldn't want someone in their 40's and at the end of their career like A.J. Foyt (42 when he won Indy 500 #4 in 1977), Bobby Unser (47 when he won Indy 500 #3 in 1981), Al Unser (47 when he won Indy 500 #4 in 1987) or even your own father (53 when he won his last race at Phoenix in 1993, ironically when Paul Tracy crashed out while leading) anywhere NEAR your cars. BTW, does that also mean YOU (45 years old this past October) won't be driving this year because of this rule? #2) I know it's a full house at AGR, but one wonders how much Mr. Tracy's run-in's with Michael in CART had to do with that statement.